If you are on social media, you must have seen the image of the handsome security officer at Changi floating around. And so has Paktor. 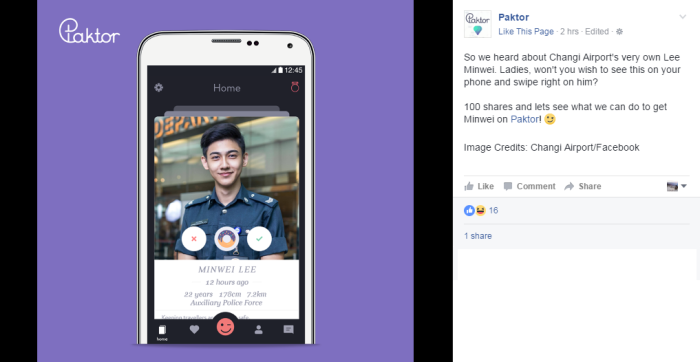 In an attempt to show its real time marketing skills, Paktor has offered the handsome Lee Minwei who has recently gone viral, a chance to be match made with female fans. Lee is a corporal in the auxiliary police force at Certis Cisco who currently does security work for Changi Airport. He first gained widespread attention when a local Twitter user shared a picture of the charming lad online, only to have it picked up by several local news outlets. This is not the first time Paktor has made such an offer for a famed individual. Previously, when it heard that Malaysian social influencer Min Chen was seeking a date for Valentines Day, it had also reached out to her. 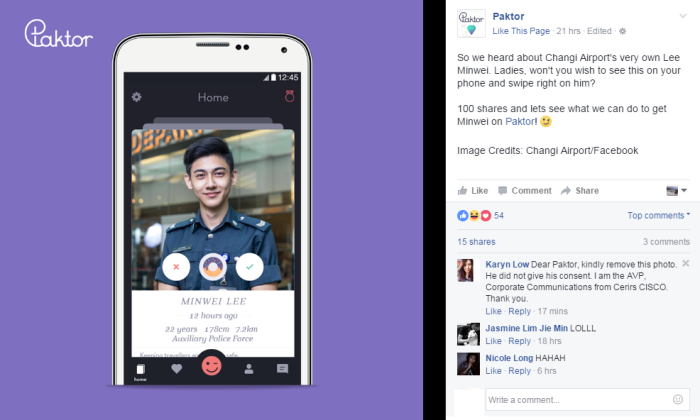 According to Darryl Liew, regional brand marketing VP at Paktor, being a homegrown company, the dating platform said it wanted to feature a local face as it feels featuring a fellow Singaporean is more apt as compared to featuring non-local models on advertisements. “However, we were unsure if our Paktor female users would be interested in such a user profile so we decided to ‘test water’ with a Facebook post to gauge reactions. If response is good, we’ll reach out to him and invite him to get on board Paktor with a sponsored user account,” he said. However, there were some concerns on the reproduction of an image for commercial gain via a marketing activation. In statement to Marketing regarding the matter, Liew admitted that Paktor did not reach out to Changi Airport to seek permission for the use of the image. However, it did credit Changi Airport Group for usage of the photo. Marketing has also reached out to Changi on the matter. While no doubt the move was a quick one for Paktor. It did raise the question on whether or not such a move is deemed ethical. Can one brand ride another brand’s marketing success without clear consent? According to Preetham Venkky, business director of KRDS Singapore, according to Facebook terms and conditions, there are no legal ramifications to using the image for content redistribution. “Asking for permission is the most ethical route to take when it comes to reposting another brand or individual’s content. There is a grey area, but brands are also considered Facebook users, so the content terms and conditions apply to them in a similar manner,” Venkky said. However, he added that it is always best practice to ask for permission before reposting an image. Prantik Mazumdar, managing partner at Happy Marketer, added that that the concerns are more ethical than legal when it comes to using another Facebook user’s content and republishing it. “If it is on Facebook, it is public domain, but the right move is to get actual permission from the brand,” Mazumdar said. For another social media consultant who wanted to remain anonymous, when a brand is embarking on real time marketing such as this, time is of the essence, especially when you’re riding on a current trending topic. “Social is all about making your brand stay current and relevant, especially if it’s keeping up with trends that are relevant to your brand. Paktor has attributed the main image back to Changi, plus there’s free publicity for Changi,” he added. Since Lee went viral, Changi Airport published a photo album titled “Faces of Changi” which featured Lee alongside other staff members of Changi Airport. The post on Lee alone garnered almost 30,000 Facebook reactions, 9,221 shares and 4,700 comments. One user Soh Hwei Min even compared Lee to Hallyu star Lee Min Ho. Is there still "unique content" in the world? In a bid to attract and retain female talent, Malaysia’s teclo brand Digi has announced a fully-paid six months’ maternity leave. ..